What is the major advantage to choosing covered or enclosed linen carts over an open design? 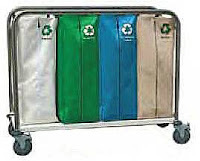 Depending on the environment in which linen carts will be used either an enclosed or an open design may be the most effective. Obviously the biggest concern will be the need to protect clean linens from exposure to dust, debris or liquids with a particular environment. Typically the enclosed laundry carts are covered with a nylon or vinyl/nylon soft cover. This can be lifted up to expose the contents of the cart and then dropped back down and into place. Closed carts do not necessarily provide full protection however. Airborne contaminants as well as dust and fine debris can still enter into the cart depending on the type of cover use. Cabinet style enclosed models provide the most significant protection while the soft cloth covers provide good levels of protection in most typical environments. Typically any linen that is going to be moved around in a building, including a hospital or medical facility, laboratory or patient area should be covered while in transit. This minimizes the risk of contamination as well as keeps linens as clean as possible before use. 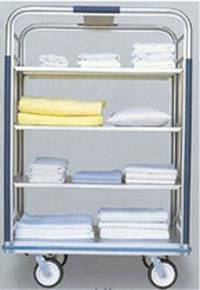 Of course a covered design also gives you the option to store the clean linen right on the laundry cart until it is needed. This can save time in transferring linens into supply cabinets or cupboards and then back onto a cart at a later time. What are the typical size options of linen carts and is there a best size? There are many different sizes of linen carts available. The larger styles enclosed baskets with multiple adjustable shelves are a good option for large facilities or areas where the distance between the laundry and the various rooms or locations in the facility is significant. Larger carts prevent multiple trips. However, larger laundry carts are also more difficult to move through busy hallways and to take in and out of individual rooms. Often a combination of smaller and larger carts is the most effective option. This allows staff to choose the right sized laundry carts for the job to be as efficient as possible. It is important to keep in mind that the size of the cart is not a factor in how easy it is to push or maneuver. The carts are designed with easy of movement in mind and with larger swivel casters they can be moved across either solid flooring or carpeted areas by staff. Handles also make pushing and turning the cart very easy regardless of weight and size. Larger carts do need more turning room and may not be ideally suited for moving in confined spaces such as elevators or narrow storage rooms. Understanding the sizes and types of linens that will be moved throughout the facility is important in selecting linen carts. Having carts that are too small for the volume is not efficient or effective. On the other hand very large carts hauling small amounts is not a good use of your budget either. Most facilities will continue to expand so selecting carts both for today's needs as well as the foreseeable future is the best possible option. In our facility we need options for moving both clean and soiled linen using the same cart. What options should we consider? When both clean and soiled linen needs to be moved using the same transport cart an excellent choice includes a turnabout cart. This allows you to use it as a bulk bin for soiled laundry and, by flipping down the wire shelves that make up the side wall, it coverts to a multi-shelved cart that can also be used for storing the linen. The wire shelves and the poly sides can be easily cleaned and disinfected between uses. This eliminates any contamination and, with quick drying materials, there is no time lost during the cleaning process.